Left: Otuoyema Group masquerades of the type referred to as Osa. Photographed by Jean Borgatti at the final performance of Igugu/Eliminya festival, Otuo, 1973. The performance was held in honor of Samuel Ogbemudia who served as military governor of what was then Midwest State. Right: Otuoyema Group masquerade photographed by Northcote Thomas (NWT 839) in Emafu (Imafun) Quarter, Otuo, in 1909. In an earlier guest blog, the art historian Professor Jean Borgatti described her first encounter with the photographic archives of Northcote Thomas in the early 1970s. She recounted how she was able to track the changes and continuities in the masquerade traditions associated with the Eliminya Festival in Otuo from Thomas’s photographs from 1909 to her own documentation of the festival in 1973, 2003 and 2016. In this second guest blog, Jean discusses the Eliminya masquerade costumes themselves in greater detail. Otuo community life is based on the principle of age-grading. Community member and teacher, I. Igbafe, described a series of 13 grades through which passed age sets formed every 5 years. (The anthropologist, R. E. Bradbury, described 11 such grades). Each grade bears a name and has specific tasks associated with it as well as specific ritual duties and roles. Masquerade and dance regalia characterize each group through the Otuoyema, or first title grade – the group moving upward in the Eliminya/Igugu festival. Igugu is a cognate with the Yoruba language term Egungun that refers to ancestors and ancestral masquerades, and was the name used by my informants in 1972-3. (Yoruba is spoken widely in Otuo as well as throughout northwest Edo communities.) Eliminya is cognate with the Edo term Erivi meaning the world of the dead and unborn, residence of the gods, the ancestors and masquerade-dancers (Melzian 1937: 55-6). Osa type masquerades photographed by Jean Borgatti at the Igugu/Eliminya festival, Otuo, in 1973. In Otuo, men between the ages of 45 and 50 both sponsor and wear masks and headdresses in festivals held to mark their entry into the group of community leaders. The sponsoring age group wears only two of the seven or eight mask types that appear, the others being worn by the age company above them. These masks are used for a season lasting 5-7 years and are thereafter destroyed. Consequently, they are almost unknown to the outside world. The masks incorporate a vast array of images that refer to ideas of power and leadership: leopards, equestrian figures, colonial officers, the Nigerian Army, heraldic angels and airplanes. The names of the masquerades belong to the esoteric lore associated with each age company, although the masks I refer to as ‘bowler hats’ are called by the popular names ‘umbrella’ or ‘helmet’ – names that suggest kingship or the military but in either case, authority. These and the ‘whipping masquerades’ are those costumes carried by the sponsoring age company [see illustrations in Jean’s previous guest blog]. The symbolism and significance of these masks also belongs to the esoteric lore of the association. However it is said that while the activity of whipping masquerades purifies the community, the ‘umbrella’ masquerades are enjoyed for their dancing. From left to right: Obagege, crested, and Ogbigbia type masquerades photographed by Jean Borgatti at the Igugu/Eliminya festival, Otuo, in 1973. All the masquerade headdresses are worn with a costume of woven raffia covering the performer’s head and torso, following the shape of his body. A fringed panel falls over his chest and shoulders. The section covering his head is embellished with a nose-like tassel. The lower hem of the costume terminates in long strands of fiber. The performer’s arms and legs, painted with linear designs, are partially visible through the fringe as is his cloth applique apron. (Today, shorts are worn rather than the backless apron worn in the past that left the buttocks exposed and visible as the fringe swayed.) Each headdress appears to give a distinctive name to the masquerade. In the parade of masked figures I witnessed in 1973, where the photographs that accompany this blog were taken, costumes worn with a towering feather headdress (Obagege), a central crest of straws bound together, and small wooden caps resembling women’s plaited hairstyles (Ogbigbia) precede the whipping masquerades (Olu), a type far outnumbering the rest since each member of the age group moving upward must wear this one. The wooden capped masqueraders are said to be for maintaining order during the public displays. Left: Olu, ‘whipping masquerades’, whose role is to disperse malevolent spirits; right: Ogbogbomudu masquerade types, which perform humorous skits in the playing ground. Photographed by Jean Borgatti at the Igugu/Eliminya festival, Otuo, in 1973. The ‘whipping masqueraders’ perform to disperse malevolent spiritual forces, each cracking his whip in an attempt to achieve a sound approximating a gunshot. (Those who succeeded were greeted with a resounding cheer.) These are followed by the ‘umbrellas’ (Ugbokpa) and the wooden helmet masks (Ogbogbomudu). These characters are said to be linked to the rains, and perform humorous skits in the playing ground. The most elaborate masks and headdresses featuring figural superstructures (Osa) come a stately last. 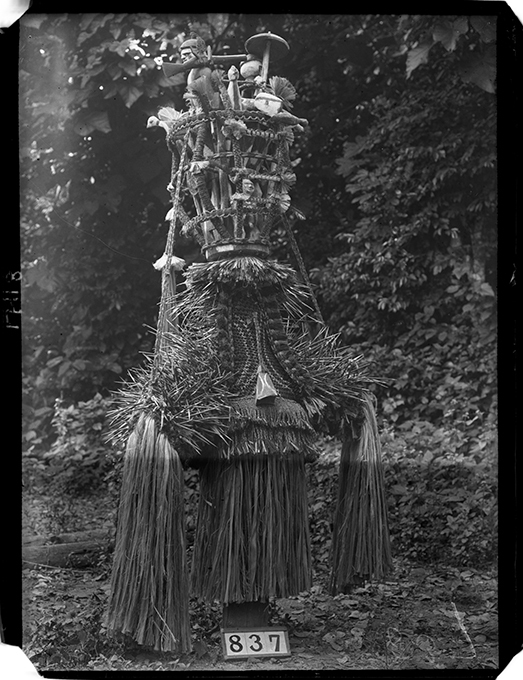 Northcote Thomas’s photograph of the Osa masquerade type in Otuo in 1909. NWT 837. That each company moving upwards in the system must provide a new set of headdresses provides for the incorporation of new motifs into the compositions and new materials into their construction. Northcote Thomas photographed only three of these masquerade types in Otuo: the whipping masquerade (Olu) and the umbrella masquerade (Ugbokpa), whose later 20th- and 21st-century counterparts are dramatically similar, and one towering Osa masquerade that appears to have a canework superstructure into which are pegged multiple small figures. The final two types of masquerade I witnessed in the 1973 parade consisted of a helmet, usually janus-faced, surmounted by a superstructure containing multiple figures or simply a multi-tiered headdress with carved figures and animals attached to the basic structure, evoking the complex example photographed by Thomas. My research in Nigeria was carried out between 1971 and 1974 under the auspices of the Federal Department of Antiquities and was partially funded by the following: UCLA Museum of Cultural History-Ralph Altman Fund and NDEA Title VI fellowships via the African Studies Center, UCLA. Research in 2002-04 and in 2014-16 was carried out under a Fulbright-Hays teaching and research fellowship at the University of Benin in Benin City. I would like to thank the people of Otuo for sharing information and experiences with me, particularly Chief Erukpe Omokhudu, Mr Isaac Adokhai Afekhai, and Teacher Igbafe of Otuo for their personal assistance in 1973. In 2003, his Highness, Julius Elugbe, the Ovie of Otuo, was instrumental in facilitating my documentation of the festival. In 2016, his nephew, Professor Ben Elugbe, was my host during the masquerades’ morning walk-about. Borgatti, J. M. 1982. ‘Age Grades, Masquerades, and Leadership among the Northern Edo’, African Arts 16 (1): 36-51+96. Bradbury, R. 1957. The Benin Kingdom and the Edo-Speaking Peoples of Southwestern Nigeria. London: International African Institute. Igbafe, I. n.d. ‘Age Group Organization in Otuo’. Unpublished manuscript given to the author, and subsequently deposited in the Robbins Library, National Museum of African Art, Smithsonian Institute, Washington, DC. Melzian, H. 1937. A Concise History of the Bini Language of Southern Nigeria. London: Kegan Paul, Trench, Trubner & Co.
Meeting themselves again. An object-oriented perspective? In an essay, ‘The buzz of displacement’, in the book The Inbetweenness of Things (Bloomsbury, 2017), Sandra Dudley draws upon the concept of an object-oriented ontology and conducts a thought-experiment to imagine how museum objects themselves might experience senses of displacement and liminality. Dudley considers the perspective of a carved wooden bee that once adorned the throne of King Thibaw in the Mandalay Palace in Burma, which has been caught in the liminal space of the Pitt Rivers Museum collection in Oxford since 1889. For the bee, the museum may be regarded as a liminal space where it is isolated from the contexts which originally animated it; the object yearns for reincorporation into that lost social and material world from which it is exiled. On the other hand, however, the museum is a space in which possibilities for incorporation into new social worlds abound as the bee forms relationships with other people and things. Dudley mentions, for example, the intimate relationship formed between the bee and a contemporary wood carver who was inspired by the bee to create a replica. Ethnographic museum objects may be said to be displaced both spatially and temporally. 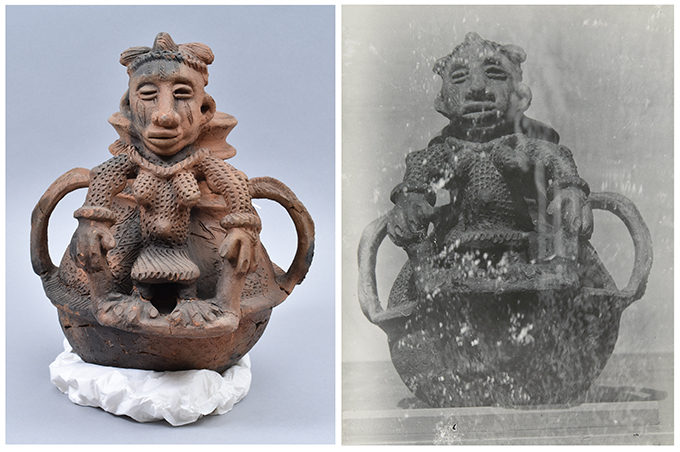 As we have been rediscovering the collections of artefacts that Northcote Thomas assembled during his anthropological surveys in Nigeria and Sierra Leone, we have also been experiencing this sense of the objects’ dislocation, but also the possibilities for reconnection in the present. The idea of reconnection and re-entanglement with the ethnographic archive is, of course, at the heart of the [Re:]Entanglements project. However, we have been struck especially by the temporal reconnections brought about in our approach to collections-based research in the museum store too – especially through our use of Thomas’s original field photographs. Thomas did not systematically photograph all the objects he collected prior to dispatching them to what was then the University of Cambridge Museum of Archaeology and Ethnology. In fact, only a small percentage of the collection was photographed either in the field or at the Museum at the time. Those photographs of ‘specimens of native manufacture’ that Thomas did take in West Africa are therefore especially valuable, and have been one of the starting points for us as we have been exploring the collections in stores. In most cases, it is only through painstaking archival research and detective work that we have been able to locate these objects today. But how thrilling when one is able to identify such objects and reunite them with their historical photographic portraits! 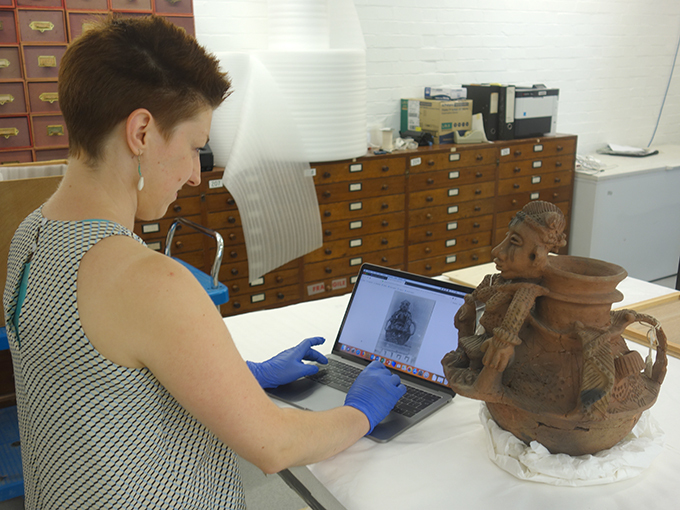 [Re:]Entanglements team member, Katrina Dring, updating the Museum record of the Olokun shrine vessel, comparing the Northcote Thomas’s field photograph of the pot with the object today. The vessel has evidently been badly damaged at some point in its biography and has been repaired. From the objects’ point of view, we wonder what the experience of being brought ‘face-to-face’ with themselves in this way must be like? Seeing their younger selves, as it were, from nearly 110 years ago, when they had newly been brought into being through the skills of artists and craftspeople in the areas in which N. W. Thomas was working. The exchange of gazes between historic photograph and object presences other times, places and people, most particularly the very moment in time when, in West Africa, Thomas clicked the shutter on his Videx camera, capturing the reflected light from these objects in the emulsion of his glass plate negatives, which we, in turn, have pored over and digitized, and used in our quest to discover those same objects in the anonymous wooden crates in which they are now housed in Cambridge. The museum affords such possibilities for presencing these temporal and spatial journeys. And this, we hope, will be just the beginning of these journeys and possibilities as we invite others to reconnect with the collections and the histories they are entangled in, both virtually, through the internet, and when we physically travel back to the locations where the objects were made with copies of Thomas’s historical photographs and the photographs we are now taking. 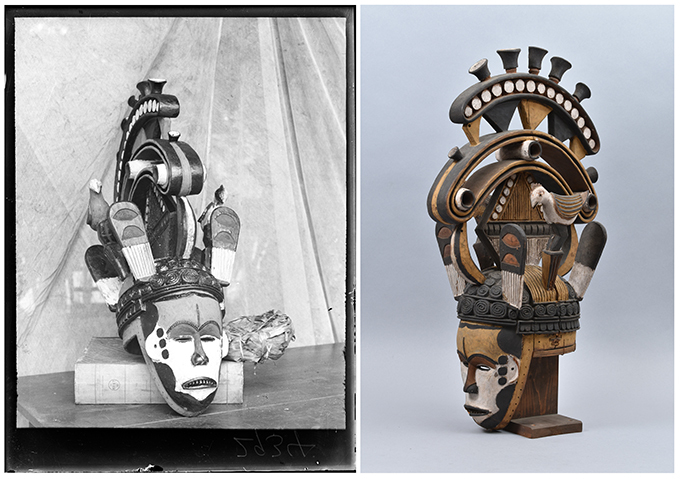 Recreating Thomas’s field photograph of two masks, labelled as ‘Ibonodike’ and ‘Wonodike’, collected in Fugar, in present-day Edo State, in 1909. (MAA Z 12252; Photograph by N. W. Thomas RAI 400.17528.) 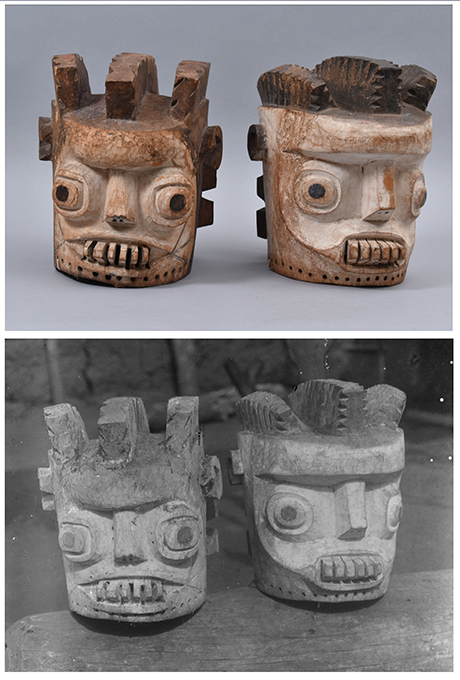 Thomas collected a large number of masks in Fugar; it seems likely that he commissioned a carver to produce various types of mask typical of the area.